You gain 140 points [?] Loyalty program points By purchasing products included in the loyalty program, you gain points, which then can be exchanged to other products available in the store or for a permanent discount. Only available to registered customers. Isn’t it tempting to get the taste of your choice packed in the form of candies and have the same texture like them? 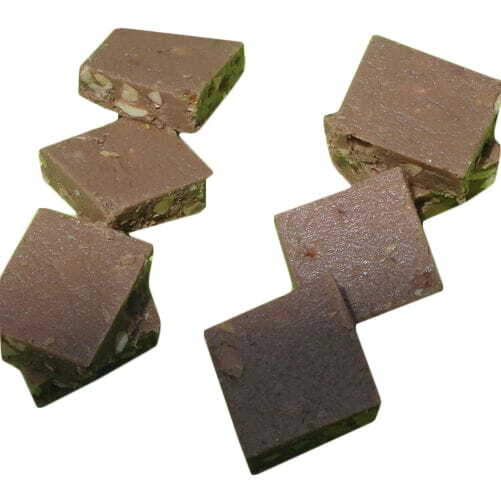 Pista bite is basically a bar of sweet that is fully engrossed with bits of pistachios which brings it a delicious taste and is covered just like candies to make it more appealing. You can either serve it as a dessert or enjoy it anywhere, at anytime just like a candy. Jay Hind in Ahemdabad deals with varieties of bites and you can select your favorite from Foodfesta.com. If you are a pistachio lover, here comes your thing. Just don’t look at it, grab it and enjoy it!